Do you have someone on your shopping list that is difficult to shop for or just don't know exactly what they need or want? Get them a Starr Gems-SilverSupplies Gift Card. You could even call the store for some help. For every card $100 or more we will gift wrap it and ship it for Free! The First & Last Name given will not be printed on the card, it is for security each person will be given a unique card number. so to verify the person when they make a purchase. (just incase the card has been lost or stolen.) Issued card will be a "dummy" card, actual card will be kept at Starr Gems and new amount emailed after each purchase. Also please indicate if you want the Gift Card shipped to the Gift Card holder or to you. Otherwise the transaction will not take place. The Starr Gems Inc-SilverSupplies Gift Card cannot be redeemed for cash, Gift Card can be used for online, in store or over the phone purchase. This Torch would be a great gift for anyone who has fascination with fire! 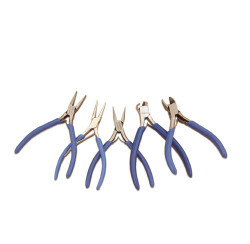 Well we supose it could be used by jewelers for small soldering repair work. We cannot ship gas but it is available for sale at grocery, hardware, smoke shops etc. 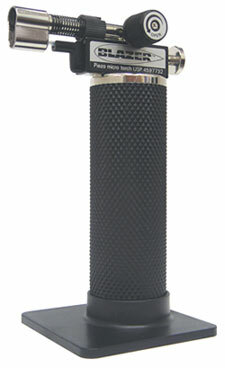 We recomend purchasing a high quality gas so as to keep your torch working in tip top condition. 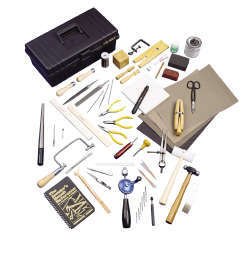 Practically everything needed for your jewelry-making projects. All first-quality tools for sawing drilling, twisting, hammering, filing, polishing, etc. V-slot board and bench clamp • 6" flat file with handle • Sawframe • 3 assorted needle files • Sawblade • Emery paper-4 assorted • Dividers • India stone • Rule-combination mm and inch • Felt hand buff for tripoli • Center punch and scriber combination • Tripoli compound • Chinese white • Chamois hand buff for rouge • Hand drill • Red rouge • Twist drills - 6 assorted • Quick-setting adhesive • Pin vise • Soldering torch • 3 pliers: round nose, flat nose, chain nose • Asbestos-free pad • Snips • Charcoal soldering block • Ball pein hammer • Binding wire • Mallet • Hard soldering flux • Wood dapping block and punches • Flux brush • Steel ring mandrel • Silver solder • Ring clamp • Pickling compound • Setting burnisher • Soldering clamp tweezers • Prong pusher • Plain tweezers • 6" half-round file with handle • Copper tongs for pickle • "Bench Reference Manual" All of the above items come in a plastic tool box. 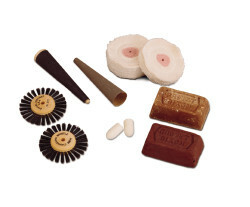 Starter sets for the individual or shop. Pro-Cast vacuum caster with accessories	• Non-asbestos gloves • Deluxe burnout oven	• 25 lbs. 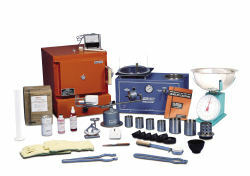 investment • Centrifugal casting unit	• Four 2-1/2" x 3" flasks • Pyrometer	• Two 3-1/2" x 4" flasks • Mixing bowl	• Sprue bases • Timer	• Borax flux • Graduated cylinder	• Vac-U-Cast • Investment scale	• Casting book • Dwt. scale	• Jewelry cleaner. Just right for 1/15 HP motors with variable speeds. 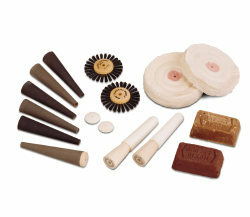 Larger buffs and brushes for 1/6 to 1/2 HP motors with 3450 RPM. 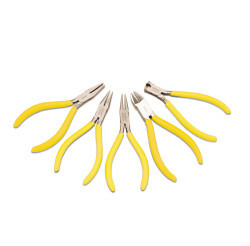 A complete, basic tweezers set. An ideal way to sample and select the proper type tweezers for most applications. 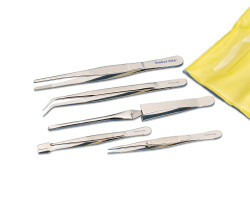 The tweezers have hundreds of uses and the deluxe vinyl pouch provides handy storage. 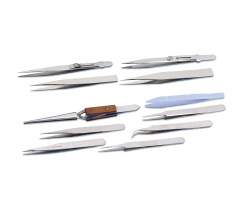 Kit contains: 4-1/2" (114 mm) pointed tweezers, 4-3/4" (121 mm) stamp tweezers, 6" (152 mm) retrieving forceps, 6" (152 mm) solder/utility tweezers and 6-1/2" (165 mm) self closing tweezers. 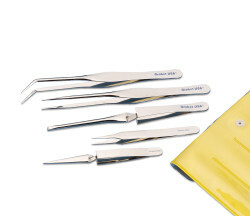 Contains two self-closing general purpose tweezers and three utility/solder types in a vinyl pouch. 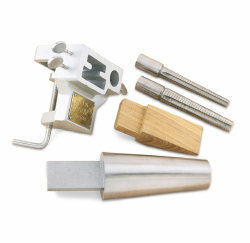 Set contains anvil with bench clamp, oval bracelet mandrel , bench pin, grooved ring mandrel with sizes 1 to 7 and grooved ring mandrel with sizes 7 to 15. Shipping weight 13 lbs. (6 kg). 4-3/4" (159 mm) Swiss style stainless tweezers: #1, #2A, #3, #5 and #7, 6-1/4" (15.9 cm) black non-reflective diamond tweezers, 5-1/2" (140 mm) chrome slide-lock fine diamond tweezers, 5" (127 mm) Boley style tweezers AA, 5-1/2" (140 mm) Boley style tweezers RR, 6-1/2" (165 mm) soldering tweezers and 4-5/8" (117 mm) plastic tweezers. Comes in a plastic pouch.